I'm a big fan of upcycling, otherwise known as reconstructing, deconstructing, recycling or customising. It all means getting more bang for your buck. I've put together a list of titles available at any good library or bookshop. I've also included a little effort of my own, hope you like it. The Complete Guide to Customising Your Clothes: Techniques and Tutorials for Personalising Your Wardrobe by Rain Blanken. Resew: Turn Thrift-Store Finds into Fabulous Designs by Jenny Wilding Cardon. 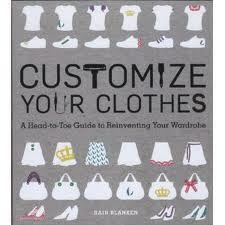 Get the Most from Your Clothes by Marian Elliott. Hand Me-Ups: Recrafting Kid's Clothes with Easy Techniques and Fun Designs by Lorine Mason. Peplums are appearing everywhere at the moment. Super flattering, and a removable one is great for getting some extra mileage out of a simple sheath dress. Do what I did and use a vintage style apron pattern, or cut off a very flaring skirt to hip length. I widened the waist measurement on my pattern so that the opening met at the back. I used a button fastening. The pattern I used was Butterick 5579 (Retro '55). I used some showy gold and black material I had been given. I'd like to try it in black lace or even velvet. Why? It all means getting more bang for your buck.